Photo Courtesy/WHEELING HOSPITAL Paxson Wojcik is making his mark, along with brother, Denham, at La Lumiere, a boarding school in Indiana. WHEELING — To get where you want to go in life, sometimes tough decisions and sacrifices have to be made. The Brothers Wojcik — Paxson and Denham — are prime examples. The sons of Wheeling Central graduate and current Michigan State assistant coach Doug Wojcik, Paxson and Denham left their home in South Carolina to attend La Lumiere — a boarding school in Indiana — because they wanted to help themselves get the chance to play Division I basketball. Paxson — who is played in his third consecutive Cancer Research Classic this weekend at WesBanco Arena — signed in November a National Letter of Intent to play at Loyola of Chicago. Yes, that same school that advanced to the Final Four last March. Denham, meanwhile, has his sights set on putting his signature on a letter of intent in the early signing period for the Class of 2021. 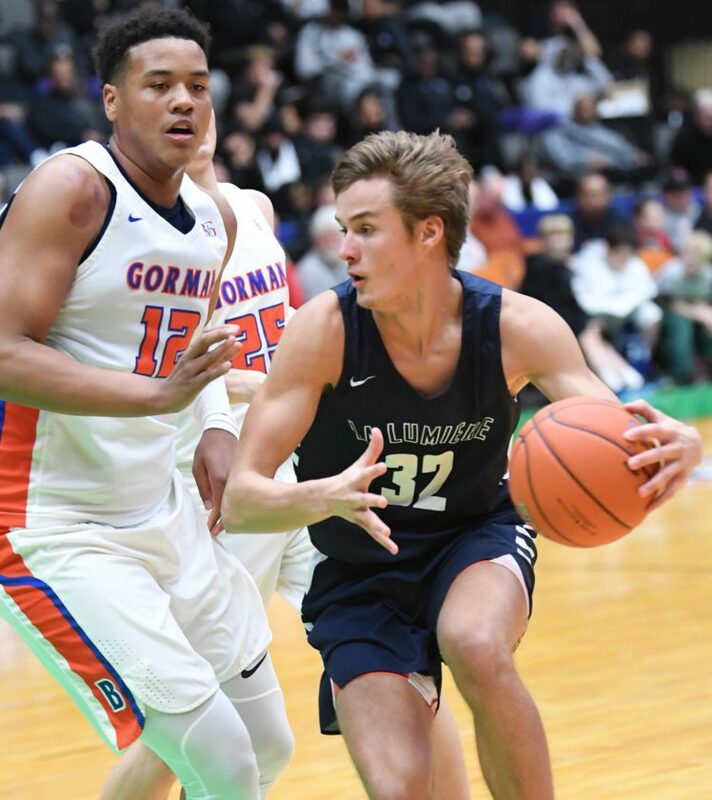 “I really liked my old school, but my number one goal is to play college basketball and right now the best way I am going to achieve that goal was to leave and attend La Lumiere,” Denham said. Denham was previously at Porter-Gaud High School in South Carolina. Both Wojciks were on the court together Friday briefly in the first half. Denham is a different player than his brother. He’s a “pass-first” point guard. Paxson is a two-guard. Though their dad couldn’t make the games since the Spartans played Saturday at Ohio State, plenty of La Lu — and more specifically Wojcik — fans were sitting behind the Lakers’ bench. Denham saw a handful of minutes in the first half, but didn’t dent the scoring column. Paxson has worked his way up the rotation. His first trip to Wheeling didn’t see him log many minutes, but he’s been a starter the last two seasons. A relatively new school of just some 70 students in Washington, Pa., First Love Christian has become a pretty regular invitee to the CRC. First Love played Saturday morning against Roselle Catholic from New Jersey. First Love’s coaching staff includes Jeremy Hayes, who is a John Marshall product. Also on the staff is former St. John Central boys head coach Jeremy Grubbs. On top of the many area prep officials that are utilized during the course of the CRC, officials assigner Doug Costain also branches out into the collegiate pool of officials. One of those who drew an assignment was Tommy Drennan. He’s a 1994 Bellaire High School graduate, who now resides in Pittsburgh. He works in the Mountain East Conference and Pennsylvania State Athletic Conference. Drennan worked the McEachern and Findlay Prep game. At the CRC, the floor seats often become a who’s who of collegiate coaches and basketball guys. Friday — the day before a lot of the teams hit the court — featured a wide variety of coaches and basketball executives. Ohio State head coach Chris Holtmann was in attendance and watched two games. He saw the Lu Lumiere and Montverde victories. “This is a great, high-level event and it’s great that it worked out that we were able to get down here,” Holtmann said. Along with Holtmann, West Virginia head coach Bob Huggins was in the crowd for the same two games. He and the Mountaineers played at Texas Saturday night. Xavier head coach Travis Steele was in attendance as well. Other Division I college staffs represented were Florida and DePaul. Montverde big man Omar Payne, who is signed with the University of Florida, had an impressive day. He scored six points. Prior to transferring to Montverde before this season, Payne played two seasons at Osceola High School in Kissimee, Fla.
His head coach there was Martins Ferry graduate Nate Alexander.